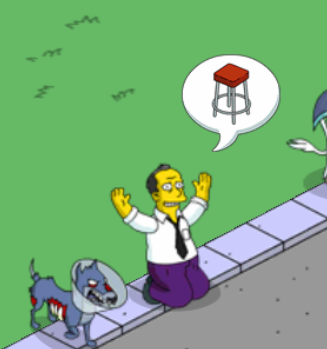 Looks like Gil’s back in Springfield. 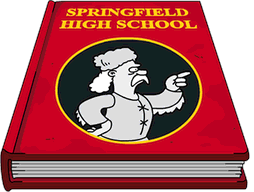 He returned to Springfield early this morning (he likes to sneak into town under the cloak of darkness…), naturally with another offer for us. What’s the latest gimmick he’s peddling? Well with all the fighting going on in Springfield, makes total sense to me that’s this time he’s pushing booze! So let’s breakdown the details of this latest offer and determine if you should spend your donuts on this Barfly Package…. Gil: With all the fighting over the Mega Playscape, Ol’ Gil has hit the skids again. Where are good guys like me supposed to nod off after a day of doing nothing? That’s what I used to ask myself before finding this Moe’s Express kit. 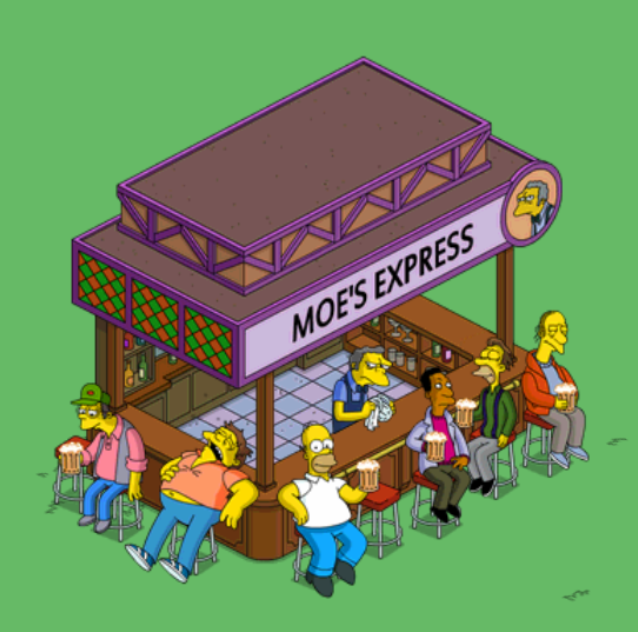 If you’d just help set ‘er up, Ol’ Gil and the boys will ahve a place to park it between sittings at Moe’s Tavern! Gil: It was worth a shot. Since I can’t even afford the nails to put this together I guess I’ll burn the wood for warmth. Gil: Wow, thanks, my pale ale pal! I’d offer to buy you a beer but my wallet’s drier than you are. Lo and behold….the Gil deal! 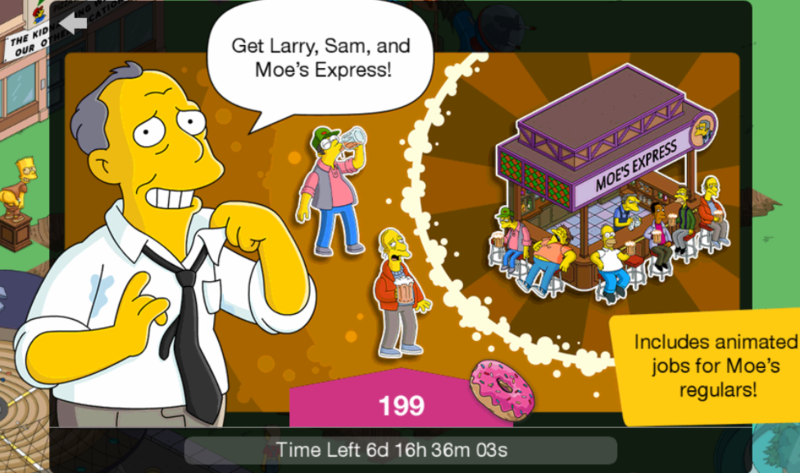 If you accept you’ll be tasked with placing Moe’s Express, once placed you’ll unlock Larry and Sam (they complete the Barflies collection, with Barney)! Of course, in the end, it’s your decision, we can only tell you what we would or wouldn’t do…and as I premium player, I already told you, I’m a big fan and picked it up. But whatever you decide, just make sure you make your final decision before it leaves our games for good (or for now). Although not listed here…Moe has a 4hr task there as well. 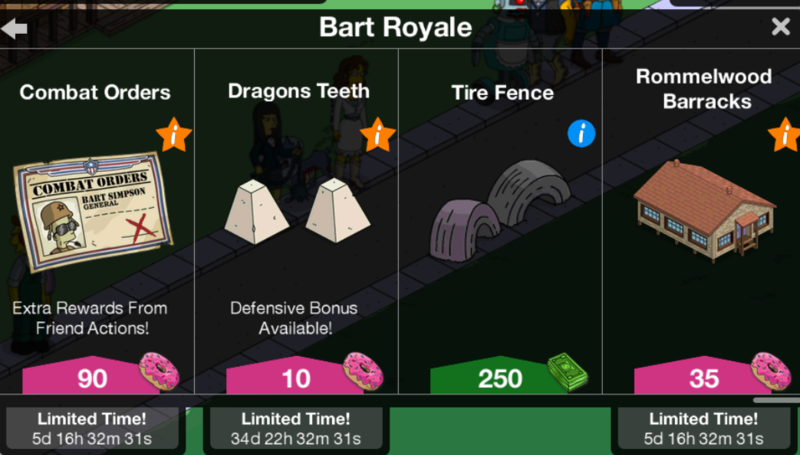 During Bart Royale it will earn prize track currency. What are your thoughts on the Moe’s Express Bundle? 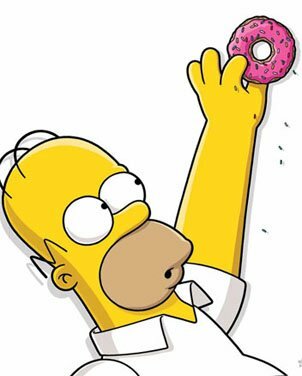 Will you be spending the donuts to bring them to your Springfield? Did you already? Why or why not? Where have you placed Moe’s Express in your town? Sound off in the comments below, you know we love hearing from you! 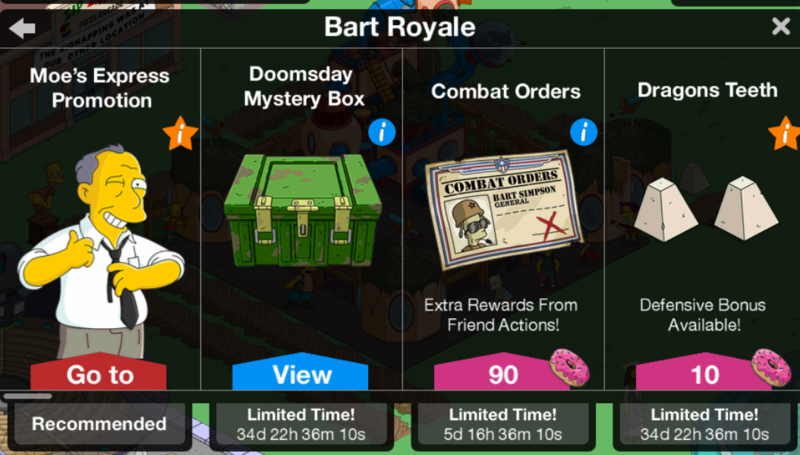 This entry was posted in Buildings, Characters, Gil Deals, Tips and Tricks, Updates and tagged Bart Royale Event, how do i earn more event currency, Larry Tasks, Sam Tasks, Should I Buy Larry, Should I Buy Moe's Express, Should I Buy Sam, Tapped Out Kids at war event, Tapped Out Tips and Tricks, Task at Moe's Express, The Simpsons Tapped Out, TSTO Addicts, TSTO Bart Royale, TSTO Homergeddon, TSTO Kids vs Adults, TSTO Tips and Tricks, What does Moe's Express do, What does Moe's Express Earn. Bookmark the permalink. Wish I had the dough(nuts). I bought it and think it’s a great deal,ppl shouldn’t be so stingy to the game. I like that you can send the jobs from the building ,I think that’s a pro. If you do it The Safi Way by turning game cash into donuts, you don’t care anymore about the price. I think it’s “dumb” to get mad at EA for later lowering the price of things. I’m sure you would also complain if they raised the price. No winning. Some ppl just like to complain. All shoppers realize you pay extra when things are brand spanking new. You wrote you eventually caught on to this universal sales tactic. or wait 6 months or longer to get it it a lower price gambled in a box with many other things. Complaining EA later lowers the price is not productive to players. Complaining EA debuts it higher priced is not productive to the company’s business. Yeah, that’s the second month of me playing the game and the second deal I got from Gil. 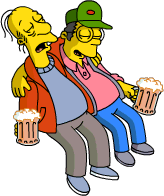 I like beer, I like the Simpsons. Pricey but I really enjoy having it. I was hoping for a good Gil deal. I’m all about collecting the older characters that I actually recognize. Sam and Larry are about as old as they get, so I’m psyched. The animated quest of all the guys at the bar is awesome. Glad I could finally help Gil out with something. I also picked up Wendell, so my classic collection is looking good these days. Moe’s Express , Larry and Sam – almost had me Gil! I’m fine if Characters are not voiced (they all can’t be), I’m grateful for Permanent Character Tasks (yes), but a Building should generate $ and XP (a shame ’cause this Building has great Visual Tasks)! Yep, both the man I love and I got this one. We’re farmers but don’t normally buy Gil deals. I’m willing to suggest it’s one of the more popular Gil deals – and that’s the advantage (to EA) of using long-standing characters instead of the one-off characters that seem to have been favoured recently. Probably the best Gil deal ever. I really like it. Bought it straight away and placed it in my fair/stage area. Wow, I love that design, it goes well with your fair area. I want this and think it’s a good deal but I only have about 300 donuts (freemium, not a KEM farmer) but I’m saving up hoping that Jesus will come back around Easter. Any idea if this might happen? 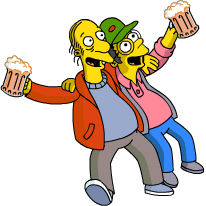 Just bought this deal and I sent Moe, Larry and Sam there yet only Moe shows up behind the bar, Larry and Sam both went to Moe’s Tavern so there’s no outside visual for these two baffles? 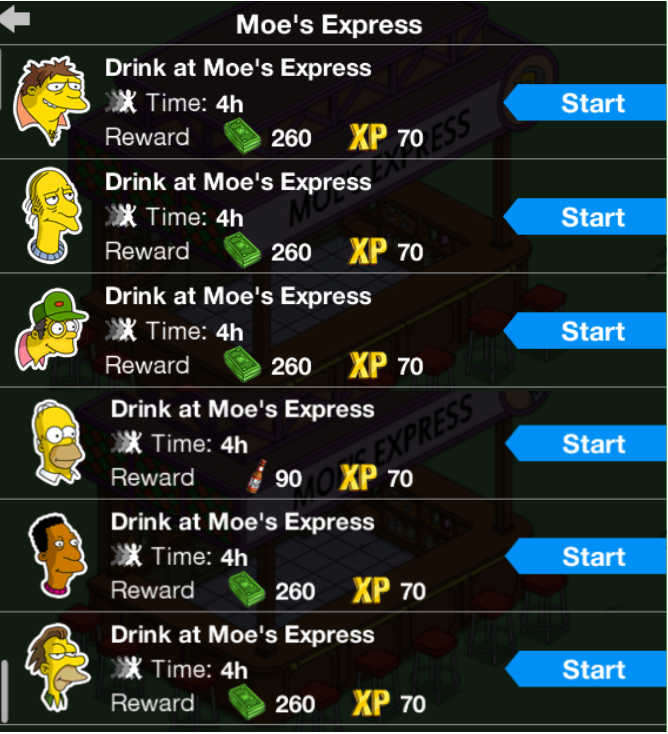 I tapped on Moe’s Express and it only let me find Moe? 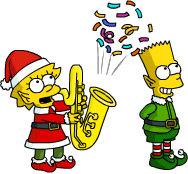 You have to finish the quest/task line before you can send the Barflys to Moe’s Express…all the quest jobs are at Moe’s or the Brown House. 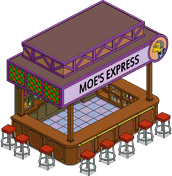 The last task in the quest is to send everyone to Moe’s Express and have Moe serve drinks there. Oh thanks a million Ebron, that’s a relief. I thought maybe that might’ve been the case. I still need to KEM farm about 15 donuts, and then it’s a buy. It will put me rock bottom at donuts but i don’t want to wait till an eventually sale. This sale could take years from now to happen, and soon those who wait now will be the first to complain it hasn’t returned yet. this is a very tough pass for me. grr. Could not pass this one up. I have been wanting these two characters since day 1…… Well at least my day 1 in Dec 2013 but nonetheless I rejoice! Just reached level 939, does it make sense to keep KEM farming or just play normal? Continue the KEM farming at your heats delight. I’ve kept at it since I hit 939. It takes twice as long to level up now, but you average 2 doughnuts every level, so it balances out to the same rate you were earning before. My 36 KEM farm gets me 4-6 doughnuts every 4 hours, which is plenty for what I want to buy from the event offerings and remaining characters. I think it makes more sense after level 939 than it did before. 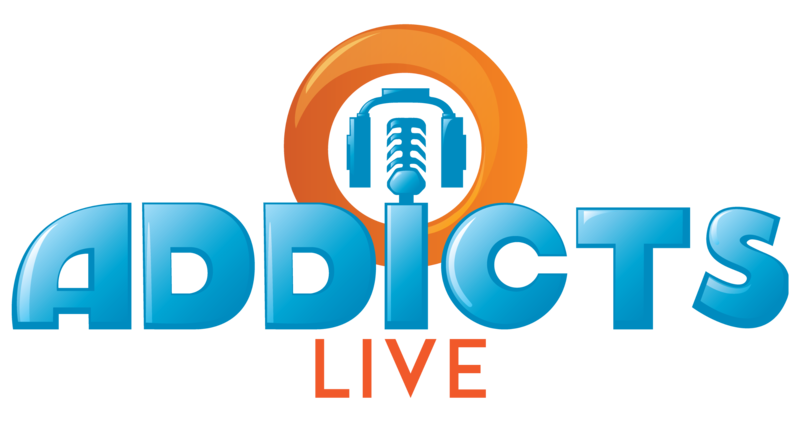 Now you get a chance at 3 donuts each time you reach 1,000,000 XP rather than 1 donut for leveling up at 500,000 XP…a better yield per XP earned. wow! after almost four years of tapping I finally grabbed my first Gil deal. This one is too fun to pass up. Love it! A tough decision. I love them both equally. I would decide it with the flip of a coin. I buy all the classic characters they’ve been including recently. Wendell, Leon, BGM, now these guys. Really hoping for Lewis eventually! Just a note on the event currency tasks: I’m expecting to get Pyro today so no need to rush for Duffs. I’d rather use the playground tasks saving up some scrap for crafting later in act II.